The Bill Russell NBA Finals Most Valuable Player Award (formerly known as the NBA Finals Most Valuable Player Award) is an annual National Basketball Association (NBA) award given since the 1969 NBA Finals. The award is decided by a panel of eleven media members, who cast votes after the conclusion of the Finals. The person with the highest number of votes wins the award. The award was originally a black trophy with a gold basketball-shaped sphere at the top, similar to the Larry O'Brien Trophy, until a new trophy was introduced in 2005 to commemorate Bill Russell. Since its inception, the award has been given to 31 players. 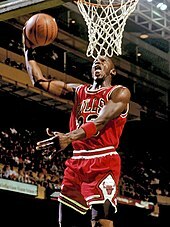 Michael Jordan is a record six-time award winner. Magic Johnson, Shaquille O'Neal, Tim Duncan and LeBron James won the award three times in their careers. 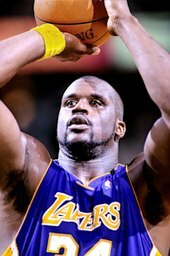 Jordan and O'Neal are the only players to win the award in three consecutive seasons (Jordan accomplished the feat on two separate occasions). Johnson is the only rookie ever to win the award, as well as the youngest at 20 years old. Andre Iguodala is the only winner to have not started every game in the series. 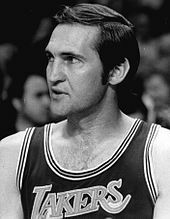 Jerry West, the first ever awardee, is the only person to win the award while being on the losing team in the NBA Finals. Willis Reed, Kareem Abdul-Jabbar, Larry Bird, Hakeem Olajuwon, Kobe Bryant, and Kevin Durant won the award twice. Olajuwon, Durant, Bryant, and James have won the award in two consecutive seasons. Abdul-Jabbar and James are the only players to win the award for two teams. Olajuwon of Nigeria, who became a naturalized U.S. citizen in 1993, Tony Parker of France, and Dirk Nowitzki of Germany are the only international players to win the award. 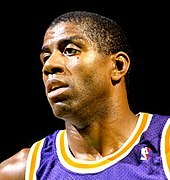 Duncan is an American citizen, but is considered an "international" player by the NBA because he was not born in one of the fifty states or Washington, D.C. Parker and Nowitzki are the only winners to have been trained totally outside the U.S.; Olajuwon played college basketball at Houston and Duncan at Wake Forest. Cedric Maxwell is the only Finals MVP winner eligible for the Hall of Fame who has not been voted in. On February 14, 2009, during the 2009 NBA All-Star Weekend in Phoenix, then-NBA Commissioner David Stern announced that the award would be renamed the "Bill Russell NBA Finals Most Valuable Player Award" in honor of 11-time NBA champion Bill Russell. Tony Parker (bottom) is the first non-American player to win the award. 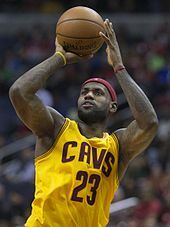 LeBron James (pictured) and Kareem Abdul-Jabbar are the only players to win the award for two teams. ^ At 20 years and 276 days old, Johnson is the youngest Finals MVP winner in history. ^ At 38 years and 54 days old, Abdul-Jabbar is the oldest Finals MVP winner in history. ^ a b c Because Tim Duncan is a United States citizen by birth, as are all natives of the U.S. Virgin Islands, he was able to play for the U.S. internationally. ^ Tony Parker was born in Belgium. He holds French citizenship and plays for their national team. "Finals Most Valuable Player". NBA/Turner Sports Interactive, Inc. Retrieved July 14, 2008. "Finals Most Valuable Players". ESPN. Retrieved July 15, 2008. ^ "Kevin Durant Wins 2017 NBA Finals MVP After Winning 1st Title with Warriors". Bleacher Report. Retrieved June 17, 2017. ^ "Game 5 Notebook: Billups Wins MVP". NBA/Turner Sports Interactive, Inc. Retrieved July 16, 2008. ^ "Spurs crowned NBA champions". CBC Sports. June 24, 2005. Retrieved July 16, 2008. ^ a b "Finals Most Valuable Player". NBA/Turner Sports Interactive, Inc. Retrieved July 14, 2008. ^ "Magic Johnson Bio". NBA/Turner Sports Interactive, Inc. Retrieved October 21, 2010. ^ Spears, Marc J. (June 17, 2013). "Danny Green's rise from role player to NBA Finals juggernaut isn't the first of its kind". Yahoo! Sports. Retrieved November 14, 2018. ^ "The Finals MVP to Receive Bill Russell MVP Award". NBA/Turner Sports Interactive, Inc. February 14, 2009. Archived from the original on February 17, 2009. Retrieved February 14, 2009. ^ "Kareem Abdul-Jabbar Bio". NBA. Retrieved August 4, 2008. ^ "Magic Johnson 1979-80 Game Log". basketball-reference. Retrieved 17 May 2016. ^ "Kareem Abdul-Jabbar 1984-85 Game Log". basketball-reference. Retrieved 17 May 2016. ^ "Parker will be speedy foe for Nets". Sports Illustrated. Time Warner Company. June 2, 2003. Retrieved October 17, 2010.